"Camden was originally an accident, but I shall never be sorry I was left over in Camden. It has brought me blessed returns." 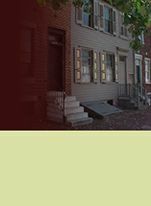 In 1884, Walt Whitman purchased a modest two-story frame house on Mickle Street for $1750. It is the only house he ever owned. He lived there until his death in 1892, at the age of seventy-two. He had come to Camden years earlier, in 1873, and lived with his brother George on nearby Stevens Street. By this time, Whitman's international reputation attracted the attention of the days most prominent literary figures. Among them, Bram Stoker and Oscar Wilde came to Camden to visit America's greatest poet. 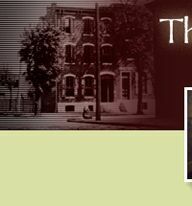 When George and his wife Louisa decided to move to rural Burlington, New Jersey, Walt chose to stay in Camden. With the surprising success of the 1882 edition of Leaves of Grass Whitman was able to purchase his own home. He soon met Mary O. Davis, the widow of a sea captain, who was renting a house on West Street. The aging poet proposed that she move into his empty house with her furniture, rent free, and keep house for him. He would provide the living expenses and pay her a small salary. Mrs. Davis moved in and remained with Whitman until his death on March 26, 1892. Whitman referred to Mary as his housekeeper and friend. 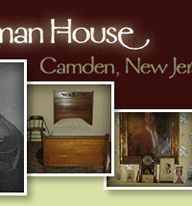 During his years in Camden, Whitman became a friend of the Philadelphia artist, Thomas Eakins. These two giants of nineteenth-century American culture found much to admire in each other's work. Each in his own medium broke with conventions, creating something new and distinctly American. Eakins photographed Whitman and painted his portrait. 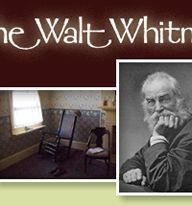 Today the Walt Whitman House, a National Historic Landmark, provides an intimate glimpse into the life of the poet, attracting visitors from around the world. Whitman's original letters, personal belongings, the bed in which he died, and the death notice that was nailed to the front door have all been preserved, as well as a collection of rare nineteenth-century photographs, including the earliest known image of Whitman - an 1848 daguerreotype.